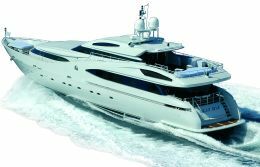 The first pleasure craft from Rodriquez Yachts, which belongs to the historic yard Rodriquez Cantieri Navali, is called Light Blue. The yard's Yacht Division, which came into being little more than two years ago, designs and builds pleasure craft over 30 metres, drawing on the long experience of the shipyard it belongs to. In fact Rodriquez Cantieri Navali is a point of reference for worldwide shipbuilding inasmuch as it has contributed, over more than 60 years, to development of the sector with technological innovations that have crowned it with success. Full load displacement: 158 t.
For further information contact Rodriquez Yachts; Via San Raineri 22; 98122 Messina, Italy; tel +39 090 7765283; fax +39 090 7765293; website www.rodriquez.it; e-mail marketing@rodriquez.it. Rodriquez is famous chiefly among commercial companies, governments and professionals of the sea, thanks to constant research work which has led to the creation of hulls that are highly hydrodynamic and the invention of systems such as those of stabilisation used on vessels like hovercraft, ferries and numerous navy ships. Rodriquez's interest in pleasure craft is the natural consequence of a history that has made technological evolution a strongpoint. But it required the creation of a specific company dealing exclusively with this field, though it draws on the Sicilian yard's precious know-how. 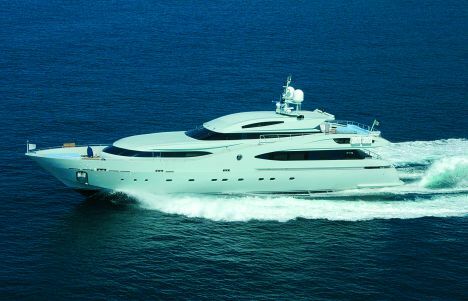 The yard's design team handled development of the platform and the interiors, which faithfully reflect the requests of the demanding owner who commissioned Light Blue. As for the design of this 38 metre yacht, the forms are the work of architect Francesco Paszkowski who has developed a layout that responds to a special requirement: spacious interior volumes while maintaining a line at once streamlined and modern. One of the solutions we note right away is the adoption of the "wide body" formula for the aft area of the superstructure which houses the sofa saloon; but the whole is aesthetically handled with a play of fullness and emptiness created with dark windows and structural elements in the same shade which give the profile an original and thrusting appearance. Highly refined forms then, created in the name of functionality and aesthetic pleasure. The yacht is developed on three decks. 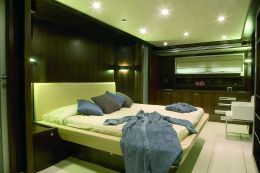 The lower deck is taken up by the night area for owner and guests, with the crew's quarters at the forward extremity. The crew's quarters are equipped with all necessary comforts for long voyages, including four cabins to sleep a total of six. 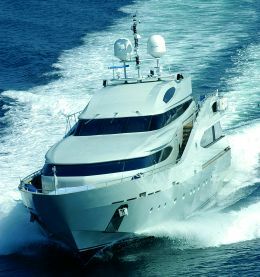 The owner's cabin stretches from amidships to the engine room and exploits the entire width of the hull. There is an office corner, a sofa, a dressing area, a spacious bathroom and a wardrobe. There are two identical cabins amidships with private bathroom and twin beds. Farther forward there are another two, mirror-image cabins but with double beds and each with its private bathroom. Three- quarters of the main deck is occupied by relaxation areas, including the spacious cockpit which is completely sheltered by the projection of the superstructure. Access to the aft sundeck is by two stairways at the sides. 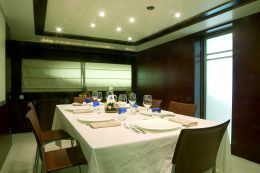 The dining area in the forward section is divided from the sofa area by a structure housing a daytime bathroom and the stairway that links the decks, as well as a large bulkhead screen facing the sofas. At the forward extremity of this deck we find the galley, the crew's mess, the pantry and laundry. The crew's night area is directly accessible from here. The amidships and forward sections of the upper deck are covered. The bridge, the only command station on board, is on this deck, a rational and functional choice inasmuch as visibility from this dominant position is total under all circumstances and the systems have the benefit of greater simplicity. Of course we are talking about a bridge worthy of such a vessel, where each technical element is set in an aesthetic context on a par with the entire yacht and where there is everything necessary for any kind of sailing the owner has a mind to experience. The amidships section of this deck is occupied by another saloon with sofas, armchairs, latest generation audiovisual systems, a bar and the spectacle offered by the great windows. Outside, in the zone aft, there is an open air living area and a sundeck farther aft with very large cushions and moveable tables. At this point it would be worthwhile taking a further look at an aspect of this yacht's interiors: they have been developed to give greater emphasis to the ample volumes, and to this end clean lines have been employed which give each space a modern and linear appearance while maintaining that aesthetic warmth which, in this writer's opinion, a yacht must possess. To all this must be added the research carried out by the yard for the natural and artificial illumination of every area on board, resulting in solutions such as great windows and sophisticated state-of-the-art lighting systems. 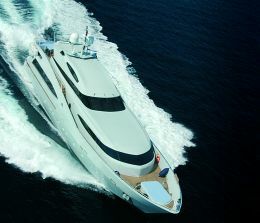 The whole is enclosed within an unmistakable style which represents the point of departure for Rodriquez Yachts. Let's go on to the strictly technical aspect of Light Blue, a superyacht with a semi-planing sharp bottom aluminium hull that can reach a maximum speed of 25 knots. At a cruising speed of 23 knots she has a range of 850 miles, powered by two 2.130 HP Caterpillar 3512B engines coupled to fixed pitch screws in V-drive. 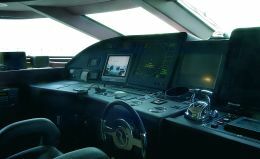 All the monitoring and control equipment, as well as the stabilisation systems, are the work of Rodriquez Marine System, employing the technology used for the latest generation high speed vessels the yard builds. Another noteworthy element is the reduction of noise and vibrations through the adoption of a particularly flexible structure in aluminium that guarantees high absorption of these phenomena throughout the vessel.